Indonesia - Outline’s Indonesian distributor Melodia Sound & Lighting Systems recently supplied a Mini-COM.P.A.S.S. line array to Surabaya’s Ciputra World mall for its new fourth-floor ballroom. The PA system, which is self-powered and driven by Outline’s iMode technology, comprises twelve Mini-COM.P.A.S.S. iMode elements and four DBS 18-2 iMode SP subwoofers, and covers an area of 700 square metres that has rather problematic acoustics. The key feature of the Mini-COM.P.A.S.S. system - enabling users to direct the sound exactly where it’s required - was decisive in this case. Almost a decade after winning a PLASA Award for Product Innovation (among the best-known pro audio manufacturers), the Mini-COM.P.A.S.S. is in fact still the world’s only compact line-source system offering up to sixteen user-definable choices of symmetrical and asymmetrical horizontal dispersion. Furthermore, real-time control is available via iPad/iPhone App. 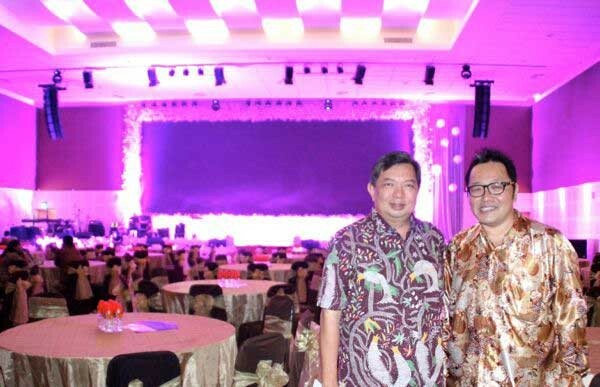 "The Ballroom 89 management chose this system after taking products by two famous brands into consideration," comments Rudy Winarto, owner and MD of Melodia Sound and Light. He explains: "The first reason that led my client to choose Outline rather than the valid competitors was the ‘adjustable directivity factor’. I think that in the sound reinforcement sector there is no field of application in which this special ‘ability’ doesn’t ensure dramatic benefits to the sound’s quality. Secondly, the system’s response at Ballroom 89 makes vocals more crystal clear, warm and ‘in the face’ - even in the last row of seats - than I've ever heard before." The COMpact Polar Adjustable Sound System (Mini-COM.P.A.S.S.) is a self-powered, bi-amped line array. Its two 1.75" compression drivers and four 5" mid-woofers deliver a peak SPL of 141 dB at one metre with four enclosures. The cabinets provide a frequency range of from 100 to 20,000 Hz. As its name suggests, its dimensions are compact, in spite of containing six transducers and the units, including flying hardware, weigh in at 23 kg (50 lb). Mini-COM.P.A.S.S. is equipped with a pair of Outline's Double Parabolic Reflective Wave Guides (D.P.R.W.G. ), a technology Outline first patented for its Butterfly line-source elements. Thanks to the adjustable horizontal directivity, the coverage angle can be set between 60 to 150 degrees in steps of 15°, offering sixteen combinations of horizontal coverage (including asymmetrical ones) to direct sonic energy where needed. The movable Mini-COM.P.A.S.S. "wings" help users avoid wall reflections and make other changes to coverage. Built-in sensors inform iMode's DSP as to the positions of each cabinet's wings, allowing automatic corrections to on-axis response.